A small, collapsible daysack is a must for anyone who travels. Whether you’re tramping tourist sites, on an impromptu summer walk or hike with a coat, or just need something to hold your book/Kindle/tablet while flying, the Vango Pac 15 packable daysack proves comfier than most, though it’s not micro-small. 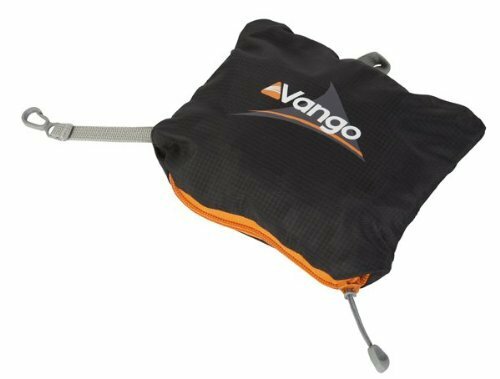 The Vango Pac 15 arrives collapsed and zipped-up in a pouch – complete with belt clip – that’s about the size of a scrunched-up shirt. As well as black with orange zips, it’s also available in maroon with pink zips. It weighs a reasonably small 198g. The Vango Pac 15 daysack has two major design highlights; as the rucksack is unfurled the pouch reverses to become the front pocket, containing within it that belt clip that now doubles as a handy clip for house or hotel keys. Better still, the doubled-sided orange zip works just as well in this orientation. Its other success is in the adjustable shoulder straps, which are slightly padded. They’re not going to sit well for long periods, but they’re nevertheless a huge improvement on the straps of much smaller clip-on alternatives, which tend to cut into the shoulder. We used the Vango Pac 15 as an emergency hiking bag during trip to Tenerife. Having travelled there on Easyjet with a cabin bag only, an impromptu decision to climb Mount Teide volcano for dawn necessitated an overnight bag that normally we wouldn’t have had. Having been stuffed in a side-pocket of a much larger cabin bag, not only did the Vango Pac 15 prove comfier on the shoulders, but its 15-litres took a couple of extra layers, a pair of binoculars and a torch without the seams bulging. The zip – so often these bags’ Achilles’ heel – proved tough and hard-wearing enough, too. Though it’s a little larger than the clip-on keyring rucksacks and totes used by shoppers, the Vango Pac 15 puts its extra bulk to good use. With comfy straps, a good study build quality that extends to decent zips and a water resistant Nylon fabric, and excellent packability, the Vango Pac 15 is a great choice for space-conscious travellers.